Everyone loves pasta! And good thing, because it is a great medium for combining ingredients to create a healthy dinner. For the ultimate rushed nights, start with your favorite pasta and then buy some pesto; after cooking the pasta, toss it in the pesto, add some freshly chopped tomatoes and enjoy. You could also make a pasta dish, such as macaroni and cheese or this crockpot spaghetti Bolognese! All of these allow you to make the sauce ahead of time, cook the pasta after work, then assemble and enjoy. Soup is an easy go to meal when you are short on time and in need of something hearty and filling, or when you need an easy healthy dinner that you can make ahead and have ready to go when you need it. Opting for a pureed soup offers the additional benefit of being able to clean out the fridge – in pureed soups, anything goes and nobody knows! You can also try or a mixed vegetable and lentil soup. For nights when you have leftovers, aren’t very hungry, or are just wanting to have a selection of smaller dishes, opting for healthy side dishes may be just the answer. Think about putting together a few smaller tapas-style plates that you could even share around at the table. For example, spring rolls are quick and easy, and dips such as hummus are healthy and filling when served with raw vegetables and pita. On those days when you feel like you have been lacking in your veggie intake, need to reign in your unhealthy eating habits, or are just feeling like the crunchy freshness of lots of vegetables and greens, a salad may be the perfect solution. This hearty grain-based salad is sure to fill you up while getting your dose of greens is easy when you eat this salad, filled with kale and Brussel sprouts! 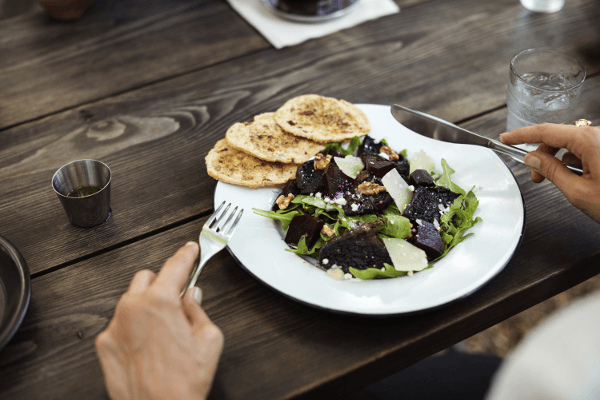 With an emphasis in the media on the need to increase vegetable intake, decrease meat consumption, and boost dietary sources of plant-based proteins, having a vegetarian dinner once a week is a great way to make this happen. When it comes to basing your meals around vegetables, there are lots of fun, simple food recipes that you can try, that will fill you up, as well as let you try something new. Veggie stir-fry, using whatever vegetables and protein option you have on hand, are great, or you can opt for a different cuisine and try something like these healthy tacos! Kids and adults alike are always a fan of Taco Tuesday, and this is a great way to make it a healthier one. Figuring out what to eat for dinner, following simple food recipes and creating healthy dinners, that you and your family can enjoy together is easier than you think. The next time you think about ordering take out, consider making one of these recipes instead or give us a call to ask about our daily food service options.